Discussion in 'Mt Buller' started by benzerknees, Jul 15, 2018. Djam says in the Trip Reports, Pics & Conditions, “There is plenty that can be done here to improve the situation for all issues, part of which I've been working on for 6 years, and about to work on it full time. It will address the parking, mountain access, both summer for bikes, winter for skiers and tourists visiting for other activities. It also covers village transport and more snow play areas.  A Gondala does get built from Mirimbah. It is quick and takes only 15 minutes. It finishes in the “wasteland” above home trail, next to the old village T- bar. Sightseers can walk to Bourke st, tobogganing etc. Skiers can ski to Shakey, or down home trail or go to Bourke st. Eventually another access lift could be built from here to near the top of Fox.  Parking at Mirimbah is limited so land near Merrijg is purchased for extra parking. Autonomous electric busses (the supercapacitor type that charge quickly) run around continuously (like the long term airport carpark). However they are smart and use a app that makes for the most efficient pickup time, and bypass non attended stops. They deliver you to the gondala at Mirimbah within 15 minutes on average. Solar, wind generation and storage are built at the merrijig parking site to power the infrastructure. Shares in the generation company are sold to punters like me, so I get a dividend and the company gets finance. Overnight stayers are mainly parked in the horse hill car park as no day trippers are allowed up the mountain. The Northside lift, has extra gondolas that are put on the line instead of chairs during peak overnighter demand and it runs into the night and very late on Friday night. At the top of northside lift, the overnighters walk straight onto an enclosed, moving walkway. (it is mostly buried so is not blocking the ski run ) The walkway finishes at a newly built "comfort station" next to Blue Bullet top station. From here the overnighters, either wait in the warmth of the comfort station for a village shuttle, or make there own way to their accommodation..... Lighten your load if you wish and leave your skis/boards in lockers overnight and collect when ready to ski. re: my season pass cost thread: the taxi service is still available in greatly reduced numbers and is more expensive and no longer needs to be subsidized by the day trippers! Vertikar and Tanuki like this. As much as all these ideas are fantastic and i wish they could happen surely the viability of snow seasons in Australia in say 50 years time has to be considered, companies cant make major investments into something that may not make a return in the future. Froff Life, Tanuki and currawong like this. Considering that Buller has only been a fully developed resort for the last 70 years since the 40s I would suggest any development that lasts 50 years from now would be worth it as much as any development in the past. In the future Buller expects to have longer seasons on fewer runs. Hence the year on year push to secure and improve the longevity and quality of those core runs, the " Buller Wagon Wheel "
Fastest way possible to $1000 day tickets! The way I see it, is they have to do something like this or just close the parking by 10:30 every peak weekend. If I knew that on a Saturday that I did not have to be "8 at the gate" , that I could be guaranteed a no fuss 10:30 am start on an icy day, i would do it. That would spread the peak out and allow more income and less stress for everyone. I have not done the taxi service since I was a kid, but I image it is still a pain, especially on a cold snowy Friday night. In fact the "Buller parking and access system" has not changed much in 40 years, while the Melbourne population has doubled I would say. What you proposed won’t happen. Just too expensive. Just because the population of Melbourne has doubled doesn’t mean the skiing visitor numbers have. 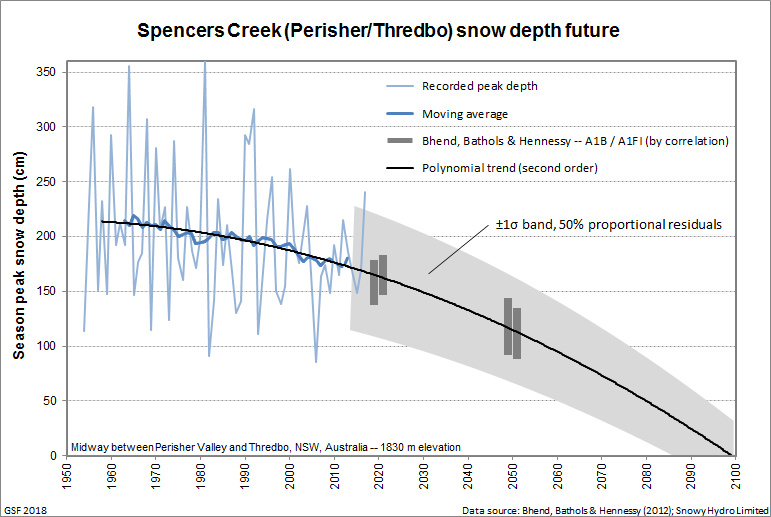 The annual snowfall at Spencers Creek is not representative of Victorian resorts it's in a different state however this is certainly not the thread thread to be making the case for climate change. There is a thread for that in Bear Pit. I'm not trying to make a case just saying that it is obvious snow depths are declining and that has been shown with real recorded data. But that is not what this thread is about. The future is the future, this thread is about solutions for now and the next 20 to 30 years. The no snow in future is the same line opponents of development at Buller have used among others but its not going to fly in here. Maybe there isn’t a problem. Presumably all day tripping skiers will be in the resort early so the only people denied access are day tripping snowball throwers. They can simply be bussed up from somewhere down low. If they change the entry to online booking only they’ll have a fair idea of how many buses will be needed. There’s NO environmental loss in tarring the Sterling road and creating a decent Buller-Sterling loop. Seth and CarveMan like this. That idea has been canvased many times and is a decent solution. Chaeron and CarveMan like this. However it is a nice peaceful snowshoe or cross country ski at the moment. Not really, Spencer's CK may be in another state but the data is relevant. Plus climate change is the god damned elephant in the room. On a positive note, I think a gondola from Mirimbah would be feasible. Speaking of elephants last season broke long time records for snow falls. So lets just get back to this thread topic. recall the what I was told, only that a lot of money was spent in that direction, for no result. the new Dam, the RMB had to offset land on Stirling, which locks up further use of that land. area has to be offset. I believe the Dam had to get approval from 5 different Government bodies. needs to be at Minister level. Not manager level (i.e. RMB). Not really, Spencer's CK may be in another state but the data is repvrele. Plus climate chagch is the god damned elephant in the room. MickM and DbSki like this. Go roll your eyes in Bear Pit and stop trying to hijack Buller development threads. Mate, you're the one hijacking it by bringing your climate change denial and trying to police others from merely mentioning it. Get over it and embrace science. I'm all for the OP and agree with it. I would love to see development at Buller, all i was saying is no developer in their right mind would consider investing without also considering the declining peak snow depth, doesn't mean investing is wrong or bad. As I said, I support the OP. I didn't initially raise the issue of the trend to declining snow depths. Someone else did. It's hard to have a discussion about long term infrastructure development and sunk costs without acknowledging global warming. Sorry.